While the market driven by short-term sentiment influenced by uncertainty regarding the future of the interest rate environment in the US, declining oil prices and the trade war with China, many smart money investors kept their optimism regarding the current bull run in the fourth quarter, while still hedging many of their long positions. However, as we know, big investors usually buy stocks with strong fundamentals, which is why we believe we can profit from imitating them. In this article, we are going to take a look at the smart money sentiment surrounding Sempra Energy (NYSE:SRE). Sempra Energy (NYSE:SRE) was in 34 hedge funds’ portfolios at the end of the fourth quarter of 2018. SRE shareholders have witnessed an increase in activity from the world’s largest hedge funds lately. 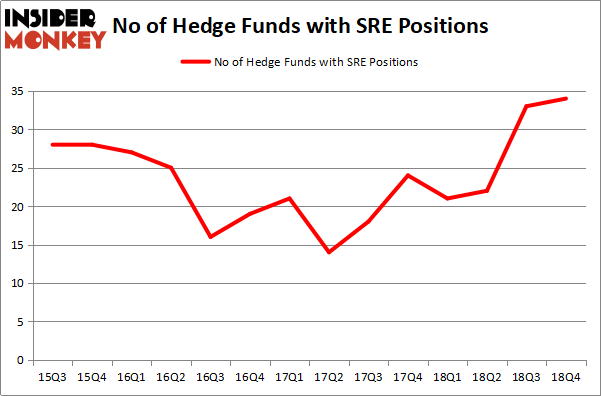 There were 33 hedge funds in our database with SRE positions at the end of the previous quarter. Our calculations also showed that SRE isn’t among the 30 most popular stocks among hedge funds. If you’d ask most traders, hedge funds are assumed to be underperforming, outdated investment tools of yesteryear. While there are more than 8000 funds trading today, We choose to focus on the moguls of this group, approximately 750 funds. These investment experts orchestrate the majority of the hedge fund industry’s total asset base, and by keeping an eye on their first-class picks, Insider Monkey has unsheathed various investment strategies that have historically defeated the S&P 500 index. Insider Monkey’s flagship hedge fund strategy outrun the S&P 500 index by nearly 5 percentage points a year since its inception in May 2014 through early November 2018. We were able to generate large returns even by identifying short candidates. Our portfolio of short stocks lost 27.5% since February 2017 (through March 12th) even though the market was up nearly 25% during the same period. We just shared a list of 6 short targets in our latest quarterly update and they are already down an average of 6% in less than a month. We’re going to take a peek at the key hedge fund action encompassing Sempra Energy (NYSE:SRE). At Q4’s end, a total of 34 of the hedge funds tracked by Insider Monkey were bullish on this stock, a change of 3% from the second quarter of 2018. By comparison, 21 hedge funds held shares or bullish call options in SRE a year ago. So, let’s review which hedge funds were among the top holders of the stock and which hedge funds were making big moves. More specifically, Elliott Management was the largest shareholder of Sempra Energy (NYSE:SRE), with a stake worth $1228 million reported as of the end of September. 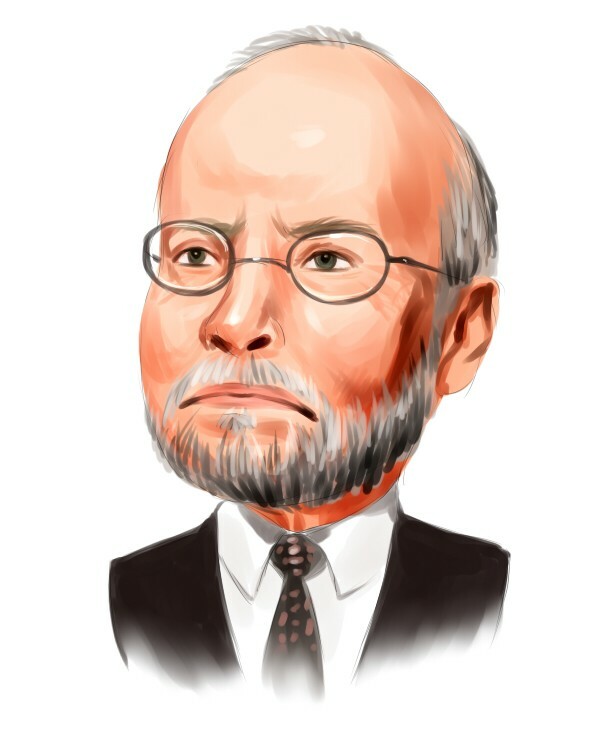 Trailing Elliott Management was Zimmer Partners, which amassed a stake valued at $884.1 million. Citadel Investment Group, Balyasny Asset Management, and Millennium Management were also very fond of the stock, giving the stock large weights in their portfolios. With a general bullishness amongst the heavyweights, key hedge funds were leading the bulls’ herd. SAYA Management, managed by Anand More, initiated the most outsized position in Sempra Energy (NYSE:SRE). SAYA Management had $18.9 million invested in the company at the end of the quarter. Michael Platt and William Reeves’s BlueCrest Capital Mgmt. also made a $8.2 million investment in the stock during the quarter. The following funds were also among the new SRE investors: D. E. Shaw’s D E Shaw, Jim Simons’s Renaissance Technologies, and Matthew Hulsizer’s PEAK6 Capital Management. Let’s check out hedge fund activity in other stocks similar to Sempra Energy (NYSE:SRE). These stocks are Fiserv, Inc. (NASDAQ:FISV), Canadian Natural Resources Limited (NYSE:CNQ), Telefonaktiebolaget LM Ericsson (publ) (NASDAQ:ERIC), and Nutrien Ltd. (NYSE:NTR). This group of stocks’ market caps are closest to SRE’s market cap. As you can see these stocks had an average of 27.5 hedge funds with bullish positions and the average amount invested in these stocks was $515 million. That figure was $2604 million in SRE’s case. Nutrien Ltd. (NYSE:NTR) is the most popular stock in this table. On the other hand Canadian Natural Resources Limited (NYSE:CNQ) is the least popular one with only 24 bullish hedge fund positions. Compared to these stocks Sempra Energy (NYSE:SRE) is more popular among hedge funds. Our calculations showed that top 15 most popular stocks among hedge funds returned 19.7% through March 15th and outperformed the S&P 500 ETF (SPY) by 6.6 percentage points. Hedge funds were also right about betting on SRE, though not to the same extent, as the stock returned 15.2% and outperformed the market as well. Is Illinois Tool Works Inc. (ITW) A Good Stock To Buy? Were Hedge Funds Right About Dumping FedEx Corporation (FDX)? Were Hedge Funds Right About Selling Northrop Grumman Corporation (NOC)? Is Vertex Pharmaceuticals Incorporated (VRTX) A Good Stock To Buy? Were Hedge Funds Right About Getting Into Bank of Montreal (BMO)? Were Hedge Funds Right About Ecolab Inc. (ECL)?